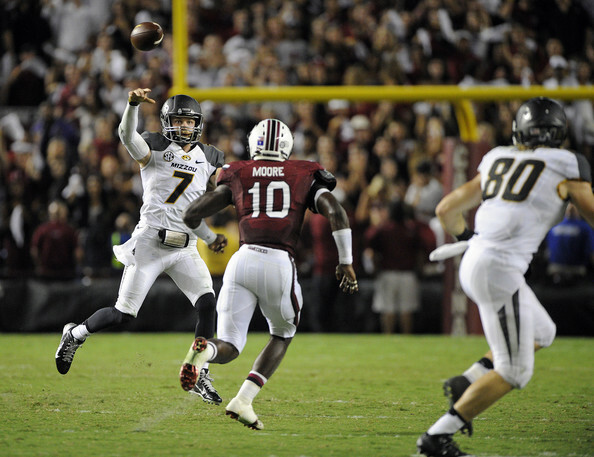 Missouri QB Maty Mauk led the Tigers to a 4th quarter comeback against South Carolina. For the second week in a row, I had to change my plans on my featured game. My original plan was to write about Stanford vs. Washington, but after Missouri’s last minute win over South Carolina, that game had to be my focus. Missouri was coming off an embarrassing loss to Indiana the previous week. South Carolina had reeled off three straight wins after losing to Texas A&M in week one. This was a defensive game for 3 ½ quarters. After taking a 7-0 lead, Missouri could not do much offensively. South Carolina reeled off 13 straight points and with 7:25 left in the game, Gamecock QB Dylan Thompson connected with receiver Pharoh Cooper to extend the South Carolina lead to 20-7. However, the momentum was about to swing in a big way. After the kickoff, Missouri QB Maty Mauk hit receiver Bud Sasser for a 41 yard gain to the Gamecock 27 yard line. On the next play Mauk hit Wesley Leftwich for a 26 yard gain to the 1 yard line and on the next play Russell Hansbrough ran it into the end zone to complete a 3 play drive that only took 0:36 off the clock. The Tigers defense, then went to work and forced a three and out. Tiger running back Marcus Murphy returned the South Carolina punt 23 yards to give Missouri the ball at their own 49 yard line with 4:40 left. Mauk and the offense went back to work. A 22 yard run by Murphy gave the Tigers the ball at the South Carolina 2 yard line. The Gamecocks defense made it tough, but on 4th down from the 1 yard line, Hansbrough dove into the end zone for his third score of the day. The extra point gave Missouri a 21-20 lead with only 1:36 left. The Tiger defense forced four straight incompletions and the comeback was complete. Missouri is now 1-0 in conference and sits atop the SEC East. South Carolina is effectively three games behind them since Missouri would win the tiebreaker because of their win over the Gamecocks. There is still a lot of football to be played, so keep an eye on the SEC East. This could get really interesting. Maty Mauk, QB, RS Soph: First full year as a starter, but he started 4 games in 2013 when James Franklin was injured. Doesn’t have great size and reminds me a bit of Johnny Manziel in both stature and style of play. Has gunslinger mentality. Likes to throw on the move and does a good job extending plays. Needs work on improving his completion percentage (only 56% so far this year). Tends to throw into coverage and needs to take better care of the ball. Thrives in up tempo. Rarely looks past the first read, then looks to make plays with his legs. Determined runner that easily jukes defenders. Completed 12 of 34 for 132 yards. Had 9 rushing yards on 6 carries. Russell Hansbrough, RB, Jr: Good feet and vision. Tough short yardage back. Gives great effort. Good in pass protection. Had 10 carries for 43 yards and 3 TD with a long run of 18 yards. Converted a 4th and 1. Marcus Murphy, RB, Sr: Quick and slippery. Keeps feet moving after contact. Tends to go out of bounds on the sidelines, rather than lower his shoulder and get the 1st down. Doesn’t need much of a hole. A good receiver. Fearless kick returner. Led the team with 98 yards rushing on 16 carries with a long gain of 22 yards. Caught 2 passes for 12 yards. Averaged 32 yards per kickoff return and 15.3 yards per punt return. Wesley Leftwich, WR, Jr: Big and physical. Willing to go over the middle. Had a 26 yard catch to set up the first score of the Missouri comeback. Bud Sasser, WR, Sr: Combination of good size and speed. Has become the go to receiver for this offense. Can line up all over. Can use his size to climb the ladder and make catches over the defender. Led the team with 6 catches for 86 yards and had a 41 yard catch that set up the first touchdown of the comeback. Also had a dropped pass. Sean Culkin, TE, RS Soph: Is not used much in the passing game, but had a big catch on 4th down to move the sticks. Mitch Morse, LT, Sr: Has good feet and is able to get downfield to help in the run game. Threw a key block on the 18 yard touchdown run. Evan Boehm, C, Jr: 30th consecutive start. Good movement skills. Able to pull and lead outside sweeps. Threw key block on 4th and 1. Connor McGovern, RG, Jr: Has played mostly right tackle, but for this game he moved to right guard. Markus Golden, DE, Sr: Best player on the defense. Played with a hamstring injury after missing last week. Creates problems in the backfield. Can move around the line and rush inside. Plays good outside containment. Had 4 tackles and 1 QB hurry. Matt Hoch, DT, Sr: Good inside pass rusher. Had 4 tackles, 1 tackle for loss and 1 sack. Harold Brantley, DT, RS Soph: Versatile player that can do a lot of things (even carried the ball against Indiana). Moves well for a big man. Able to drop into coverage. Had 1 tackle, 1 tackle for loss, 1 sack and 1 QB hurry. Shane Ray, DE, Jr: Disruptive. Relentless pass rusher. Has a good inside pass move. Able to drop into coverage. Was all over the field. Had 8 tackles, 2 tackles for loss, 2 sacks and 1 QB hurry. Michael Sherer, MLB, RS Soph: Moves well through trash. Plays downhill and takes on ball carriers. Pursues down the line of scrimmage. Had 9 tackles and ½ tackle for loss. Kentrell Brothers, OLB, Jr: Athletic linebacker that runs sideline to sideline. Does a good job dropping into coverage. Led the team with 10 tackles, 2 tackles for loss and 2 pass breakups. Made a great 4th down stop on the first drive of the game. Ian Simon, FS, Jr: Good playing deep center field. Physical player that times his hits well. Knows how to use big hits to separate the ball from the receiver. Had 4 tackles and 1 pass breakup. Braylon Webb, SS, Sr: Does a good job reading the QB’s eyes and breaking on the ball. Also able to play in the box. Had 6 tackles and 1 pass breakup. Dylan Thompson, QB, Sr: Has good zip on the ball and also has nice touch to get the ball into tight windows. Needs to work on ball placement. Tough player that will stand in the pocket and take hits. Sneaky runner that runs tough. Effective on quarterback sneak. Complete 21 of 37 for 219 yards and 1 TD. Mike Davis, RB, Jr: Powerful, compact runner that weaves his way through traffic. Tough to bring down once he gets his momentum started. Has the ability to take over a game. Has good burst through the hole. Great vision and cutback ability. A good receiver out of the backfield. Led the team with 104 yards on 22 carries and had 1 TD. Brandon Wilds, RB, Jr: Big and physical. Has decent moves in space. Bulls over defenders. Good on check down passes. Makes good moves in traffic. Used as a closer to run time off the clock. Carried 8 times for 38 yards and had 4 catches for 24 yards. Damiere Byrd, WR, Sr: Fastest player on the team. Good low ball catcher. Needs to improve his concentration and footwork along the sideline. Plays special teams and covers punts. Had 1 catch for 15 yards. Nick Jones, WR, Sr: Nickname is “The Governor”. Good speed. Dangerous in space. Led the team with 5 catches for 72 yards and had a 47 yard catch. Rory Anderson, TE, Sr: Didn’t have a great game mentally. Needs to work on field awareness. Ran a couple of routes short of the sticks on 3rd down. Good blocker. Had 5 catches for 21 yards. Had a false start penalty on 3rd and 1. Corey Robinson, LT, Sr: Good feet and athleticism for a man his size. Able to get to the second level to block linebackers. J.T. Surrat, DT, Sr: Gets off blocks quickly. Disruptive run stuffer. Had 7 tackles, 1 ½ tackles for loss and 1 sack. Gerald Dixon Jr., DT, Jr: Space eater. Ties up the middle. Had 1 tackle. Gerald Dixon, DE, RS Soph: Creates havoc in the backfield. Has good power move. Good form tackler. Contains well. Had 4 tackles, 3 tackles for loss and 1 sack. Sharrod Golightly, SS, Sr: Plays a hybrid linebacker/safety position, but is too light to be a linebacker at the next level. Made a good play on a pass, but dropped the pick. Had an offside penalty that negated an interception. Had 2 tackles and 2 pass breakups. T. J. Gurley, FS, Jr: Sheds blocks quickly. Does a good job reading his keys and making plays. Had 5 tackles, tackle for loss and 1 pass breakup. Was called for a pass interference penalty. This entry was posted on October 1, 2014 by draftmaniacs in Scouting reports and tagged 2015 NFL draft, Brandon Wilds, Braylon Webb, Bud Sasser, Connor McGovern, Corey Robinson, Damiere Byrd, Dylan Thompson, Evan Boehm, Gerald Dixon, Gerald Dixon Jr., Harold Brantley, Ian Simon, J.T. Surrat, Kentrell Brothers, Marcus Murphy, Markus Golden, Matt Hoch, Maty Mauk, Michael Sherer, Mike Davis, Missouri Tiger football, Mitch Morse, NFL, NFL Draft, Nick Jones, Rory Anderson, Russell Hansbrough, Sean Culkin, SEC East, Shane Ray, Sharrod Golightly, South Carolina football, T.J. Gurley, Wesley Leftwich.